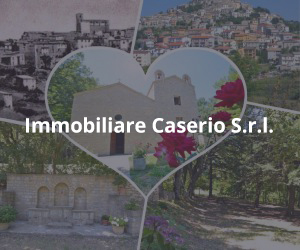 “Salsicciotto Frentano” is produced in the Frentano area, in other words the Lanciano district and the municipal territories of Alta and Media Sangro Aventino valley, on the eastern Maiella slopes. 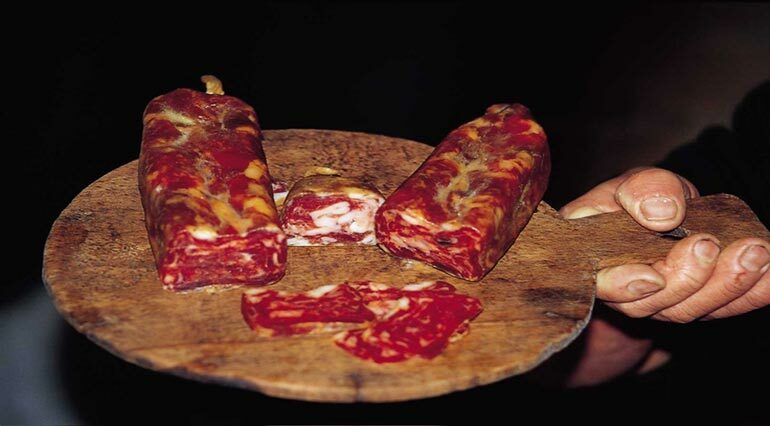 This “salsicciotto” is considered one of the leanest pork products and consists of individual salamis, often slightly curved due to the shape of the intestine section used for the casing, about 150mm long and 60-100mm wide. 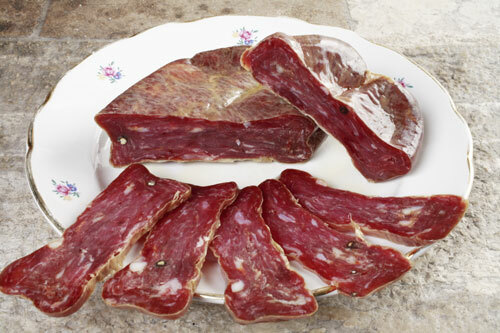 The flattened profile is achieved at the pressing stage; the salami is bound at each end with medium gauge string. The outer surface is greasy, due to the olive oil or pork lard used for preservation. The best cuts of pork are used for the filling (ham, shoulder and loin separated from the neck) and are mixed with salt (25-35g per kg of meat), black peppercorns and ground black pepper, small amounts of fat; casings are made from gut, called “culare” and derived from the pig’s large intestine. The intestine is prepared by carefully washing it in running water and lemon juice, so that when it is defatted it can be cut into 20cm lengths, and left to soak in water and vinegar or water and lemon juice until it is required. In the past the gut would be cleaned with tomato juice or with lye made from ashes. Since the pig is slaughtered traditionally when the weather is suitable (low temperatures and low air humidity, even better if there is snow or ice), before proceeding to prepare the filling, the carcasses are left to hang for 1-2 days in a cool room. After this, the carcasses are sectioned, boned and flayed, so the best cuts of meat can be chosen. This meat is then ground with grinders that have special grilles with larger perforations than those normally used for sausages. After the meat has been ground, the filling is prepared by hand, adding small pieces of fat, 25-35g of salt per kg of meat (less salt in cold areas, more salt in warm areas), black peppercorns and some ground black pepper also. After careful mixing, the filling is left to rest and flavour for a few hours, until it is cased. Casings are stuffed with a manual filling device, using the previously prepared sections of intestine, which are bound with twine at the ends, then pierced with a pin to remove any air pockets that may have formed. Before passing to the next stage of ripening in a suitable location, it is a good idea to leave the salamis to drip for about 12 hours. The sausages produced are hung on wooden or metal boards in a cool dry place to encourage water loss, drying out and consequently achieving a firmer consistency. After 5-7 days the product is pressed between two wooden planks covered with weights. Pressing lasts for two days and the purpose is to eliminate excess air, causing the sausages to take on their traditional flattened shape and firmer consistency. After pressing, the sausages are hung again and left to ripen slowly to make them firmer, which is essential before proceeding to the preservation stage. Important references to this particular type of sausage can be found in the Ancient Chapters of the Town of Lanciano (1592), kept in the town’s historical archives.